While much of the political world is past the “will she or won’t she” debate about Palin and the 2012 race, there’s one candidate who should be rooting hard for the 2008 vice presidential nominee to run. And his name is Mitt Romney. Up until the last few weeks, the former Massachusetts governor had been coasting in the contest — watching as his opponents squabbled amongst themselves while polling suggested he remained atop the field. Then, Texas Gov. Rick Perry decided to run. In the two weeks since Perry has been in the race, he has soared to the top of two national polls leading Romney by 12 in each one. And, if you dig into the guts of each of those polls — and Fix loves poll guts — it becomes clear that Perry’s strength is in his ability to appeal to the tea party and establishment wings of the party. In the Gallup poll, Perry has a 21-point lead over his nearest rival among tea party supporters, but is also within the margin of error with Romney among those who don’t identify with the tea party. The CNN survey finds more of the same; Perry not only leads Rep. Michele Bachmann by a 41 percent-to-17 percent margin among tea party supporters, but also takes 25 percent to Romney’s 22 percent among Republicans who express neutral opinions about the tea party. Those numbers make clear what Romney needs to be the nominee: a) fracture Perry’s tea party coalition and b) coalesce the non-tea party element of the GOP (aka the establishment) more strongly behind his candidacy. Palin can, theoretically, help him do both. While Palin’s support has eroded considerably within the GOP, she remains a major figure among tea party loyalists — and has courted the group assiduously (or, as assiduously as she courts any group). With Palin in the race, there would be three “big” figures — Palin, Perry and Bachmann— all competing for tea party voters. Assuming none of the three run away with the support of a large number of tea partiers — and Perry clearly has the best chance to do that — the resulting fracturing of the vote would allow Romney a path to victory. The other way that a Palin candidacy would help Romney is to allow him convince more establishment types that he is the only candidate in the field who can maximize the party’s opportunity against President Obama in 2012. The fear of Palin as the party’s nominee remains palpable for many members of the Republican establishment. And some of Perry’s recent comments — Fed Chair Ben Bernanke as “treasonous” being the main one — have given some in the professional political class pause about his ability to keep the spotlight on Obama in a general election. With Palin running, Romney would be more easily able to make an argument that she, Perry and Bachmann are all birds of a feather — candidates who play well to the GOP base but who can’t win a general election. And with Republican voters prizing electability more highly than is traditionally true — the distaste for Obama and his policies being so strong — there is a reasonable scenario by which Romney rides the “don’t throw away this opportunity” message to the nomination. That reality could help Romney in two different ways. First, it could blunt the momentum that Perry has been building since getting into the race. Second, it could take the focus off of Romney’s weaknesses (health care, flip-flops on social issues) and highlight his strengths (electability, economy). A few months back, Romney was asked how he felt about Palin making a trip to New Hampshire on the same day he announced his presidential campaign in the state. “In a lot of respects, it’s the best thing that could happen to me,” Romney said at the time. It was true then, and it’s even more true now. Romney should badly want (need?) 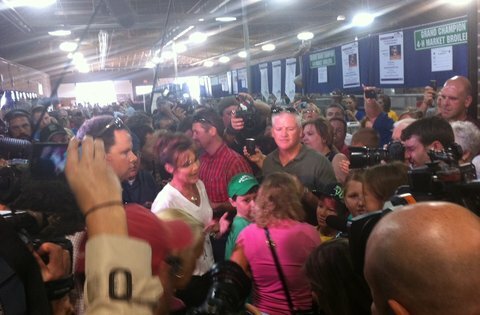 Palin to run as she could splinter the tea party vote and put electability front and center. That’s a recipe for electoral success for Romney. DGA-aligned group launches W.Va. ad: A new group aligned with the Democratic Governors Association is going up with an ad in the West Virginia governor’s race. The ad is run by a 501(c)(4) named America Works USA, which lists the DGA as a donor, and is six figures. It hits Republican nominee Bill Maloney by calling him a “millionaire businessman” who plays “by a different set of rules.” It accuses him of making political contributions to benefit his business associates, paying his taxes late and opposing stronger safety standards. The attacks are along the same lines as the ones used against GOP Senate candidate John Raese last year. Democratic are favored to hold the seat in the Oct. 4 special election, which is for the final year of now-Sen. Joe Manchin’s (D) term. Acting Gov. Earl Ray Tomblin (D) has significantly outraised Maloney, but Maloney has personal money. CWA targets 25: The Communications Workers of America union is going into more than two dozen districts to target Republicans over the Federal Aviation Administration Reauthorization bill, which unions say contained a union-busting provision. The targets are Reps. Paul Gosar (Ariz.), David Schweikert (Ariz.), Dan Lungren (Calif.), Mary Bono Mack (Calif.), Tom Latham (Iowa), Randy Hultgren (Ill.), Bobby Schilling (Ill.), Andy Harris (Md. ), Erik Paulsen (Minn.), Chip Cravaack (Minn.), Frank Guinta (N.H.), Charlie Bass (N.H.), Leonard Lance (N.J.), Joe Heck (Nev.), Nan Hayworth (N.Y.), Richard Hanna (N.Y.), Tom Reed (N.Y.), Jim Gerlach (Pa.), Mike Fitzpatrick (Pa.), Lou Barletta (Pa.), Charlie Dent (Pa.), Blake Farenthold (Texas), Jaime Herrera-Beutler (Wash.) and Sean Duffy (Wis.), as well as Transportation Committee Chairman Mica (Fla.). Bachmann memoir out in November: The book Bachmann has been working on is done and will be released this fall. Wall Street Journal columnist John Fund is denying previous reports that he worked with Bachmann on the memoir. Bachmann will appear at a Tea Party Express rally Wednesday in Des Moines, Iowa — a few days before Palin speaks at another tea party event. President Obama’s uncle has been arrested for drunk driving. Obama has trouble with white people and women, per a new AP-Gfk poll. House Minority Whip Steny Hoyer is doing three events for special election candidate Kate Marshall (D) on Tuesday — a sign that Democrats think there is some hope in a conservative district. An executive in the Huntsman family corporation sets up an independent expenditure operation — a Our Destiny PAC — which some see as a conduit for the Huntsman family to support the former Utah governor’s campaign. Missouri Lt. Gov. Peter Kinder (R), who hasn’t officially launched his governor campaign, says he won’t run for governor unless he thinks he can win. Louisiana Gov. Bobby Jindal (R) says he will endorse a GOP presidential candidate after his reelection bid this year.